If there’s one thing to be said about the current marketplace, it must be that there are plenty of options. Just ordering a pizza comes with dozens of different choices: choose the size, the sauce, the cheese, and toppings; flavored crust? – Which flavor? And how do you want that cooked? The world of credit cards is no different, with options for anything you need — or want — your card to do. Cash back on every purchase? There’s a card for that. Do you travel so often pilots know your name? Pick up an awesome travel rewards card. There are so many options for different types of credit cards that your biggest problem may be choosing which card is best for your needs. That’s why we’ve put together a veritable credit card comparison guide. If you already know which type of card you’d like to explore, use the menu below to jump to the best card for you. For those of us always looking for a deal, it doesn’t get much better than a cash back rewards card. It’s like having an extra coupon you can apply to every purchase. The amount of cash back on your purchases varies by card, and different types of cards may offer higher percentages in certain categories, like gas or groceries. Some cards even have variable categories, with the higher bonus percentages changing as frequently as by the month. Most cards will let you redeem rewards at any time, but some require a minimum rewards amount. Also, don’t forget that your rewards card is still a credit card – make sure you compare the interest rates and annual fees, too. Can’t decide? Our experts have picked their number one cash back credit card. From the chronic jet-setters to the summer vacation junkies, there is a travel rewards card to meet the needs of any traveler. The options for travel cards are many, and can include everything from specific airlines or hotels to rental car coverage and baggage protection. Keep a close eye on blackout dates, and those oft-overlooked annual fees. International travelers should also compare foreign transaction fees, as they can really add up. Our top choice is a great place to start your travel rewards comparison. If you can’t decide between a cash back card or one offering travel miles, try a card that offers points, instead. The best of both rewards worlds, most points cards allow you to redeem your points for cash, gift cards, or travel expenses. When comparing points cards, make sure you look for a sweet sign-up bonus, like extra points for new cards or an introductory double-points period. The types of rewards for which points can be redeemed will vary by card, as will the usual factors like annual fees and interest rates. Also, watch out for expiring points. Take a look at our favorite points rewards card. There’s nothing like being a business owner to help you find joy in the simple things — such as becoming truly excited about a delivery of new office supplies. The only thing better? Getting cash rewards for those office supplies! When comparing business credit cards, the rewards programs can be a big incentive one way or the other — but they shouldn’t be your only consideration. As with a personal credit card, business cards have annual fees and maximum spending limits. While some have introductory offers with low interest rates, watch out that you don’t get sticker shock when the real APR kicks in. Even when comparing rewards programs, keep in mind things like rotating rewards categories, blackout dates on travel, and point expiration dates. See our top pick in business cards for an expert’s opinion. Ah, every student’s dream: getting paid to get good grades. Sound too good to be true? Well, it isn’t! Many of the credit cards geared toward students are loaded with education-based perks, including an annual good grade statement credit and cash back on textbook purchases from places like Amazon. Other great features can include choosing your due date, waived annual fees, and late payment forgiveness. While lots of student cards offer big sign-up bonuses, watch out for APRs that skyrocket after the bonus period, or rewards with expiration dates. Our team identified the best student card on the market right now. If the idea of a two-digit interest rate has given you a bad case of credit-card cold feet, try a card that offers a 0% introductory APR. These are like super sign-up bonuses that let you carry a balance without being charged interest. When comparing cards with no interest, make sure to determine the duration of the introductory period – most cards offer 6- to 18-month terms. Don’t forget to check the annual fees, and keep an eye on the after-offer interest rate, as well – these can sometimes be quite high. Check out our top pick below. For many, the biggest sting from the monthly credit card bill is that high interest payment. Even the smallest balance can balloon into a shocking total when left to the mercies of compound interest. If high interest rates have turned your mild-mannered debt into a hulking beast, don’t fear – balance transfer cards are here. A balance transfer is a process by which credit card debt can be moved from one card to another card – preferably one with a much lower interest rate. The real win is transferring to a card that offers an introductory 0% APR on existing balances. Most credit cards marketed for balance transfer offer free or discounted transfer fees, and many offer cash back or points rewards, too. Here’s our favorite balance transfer card, featuring an introductory 0% APR. Whether building up your credit for the first time or recovering from a credit mistake, having “middle of the road” credit can open doors closed to those in worse financial shape – but it’s not without drawbacks, either. Many of the cards open to those with stellar credit may still be available to you, but the interest rates may not be quite so appealing. To get a fair deal out of your “fair” credit, make sure to compare offers for the lowest APR and annual fees. Most cards will also have cash, mile, or point bonuses, so determine which type of rewards best fits your lifestyle. Or let us do the work – see our experts’ selection for a great deal. Like the age-old catch-22 of business – you need a job to get a job – so tends to go the modern finance world: without an established credit history, it can be a challenge to get new credit. Luckily, there are credit cards just for those with limited, or even nonexistent, credit – many of which offer the same cash back or travel rewards as any other card. Any comparison of credit cards should include the annual fees and sign-up bonuses, as well as any expiration dates for rewards. Many new cards also provide your FICO credit score, so you can keep track of your growing credit. Unsure where to start? Try our top card for those with limited credit. There are few things as financially disheartening than trying to get approved for a credit card when your credit score is on the sad-face-emoji side of the rating spectrum, but don’t despair. There are tons of great card offers designed specifically for those with struggling credit. When comparing credit options, one major decision will be whether to get a secured or unsecured card. Your exact credit score may make the decision for you, as unsecured cards have a minimum credit score for approval. As for APRs, while your interest rate will likely be higher than those folks with better credit, you still want to shop around for the lowest option. Look for cards that let you track your FICO score to monitor improvements. 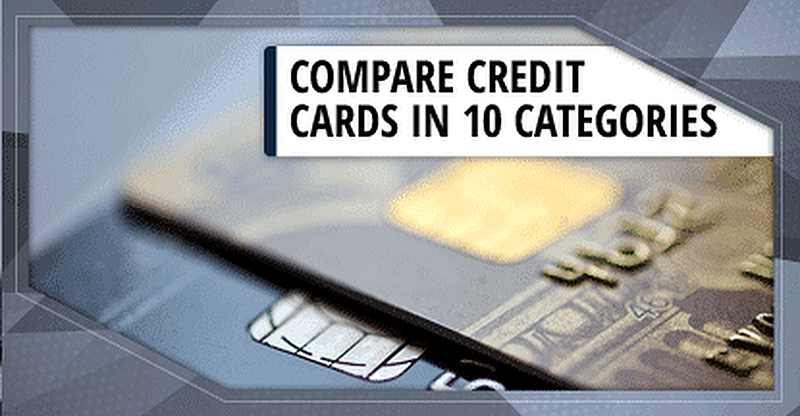 For a jump-start on your comparison shopping, see which card we’ve ranked number one. The world of credit cards is as full of options as any coffee shop or restaurant, and making the right choice can seem a bit daunting. By knowing your options – and how best to compare them – you can make an informed decision about your credit card future. After thoroughly comparing my own options, I made a few decisions, too: the large pie, with red sauce, covered in mozzarella cheese. Add pineapple and extra pepperoni – and put it on my points card!